The conservation group American Rivers released its annual list of America’s Most Endangered Rivers on April 7, 2015, and the Colorado River in the Grand Canyon topped the list. The significance of the Grand Canyon as one of the country’s most well known National Parks set it apart from the other rivers on the list, including the Columbia River in the Pacific Northwest and the Holston River in Tennessee. endangered Colorado River prepared by Madison Cramer. 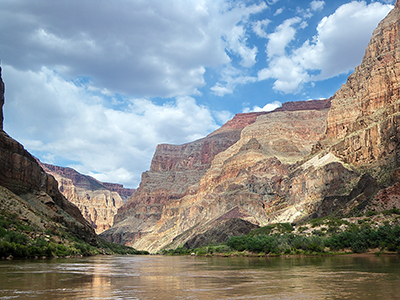 American Rivers named three major threats to the Colorado River in the Grand Canyon. The first is a construction project known as the Grand Canyon Escalade, which will be two million square feet and take place on the east rim of the park. The project includes a tram that would take visitors to the bottom of the canyon, resort complexes and other facilities near river level. The project is set to begin construction in 2016. American Rivers is steady in its opposition to this project, citing several negative effects it could have on the river. Developer Lamar Whitmer disagrees that the project will have any effect on the park. The Colorado River totals 1,450 miles, 277 of which run through the Grand Canyon National Park (Photos courtesy of Alan English). Another threat to the Colorado River listed by American Rivers is the proposed expansion of the nearby town of Tusayan, Ariz. This project includes the construction of more than 2,000 houses and more than three million square feet of commercial facilities, including restaurants, hotels and a spa. The American Rivers report says that construction in the town, which currently has a population of about 550 people, would greatly affect the groundwater supply of the area. According to Eberle, current groundwater extraction from the town is already affecting the South Rim of the canyon, and this expansion would further harm the already fragile environment in the area. The Colorado River stretches from Colorado to California and is the primary river of the southwestern region of the United States. “Further groundwater pumping could dry up some of the canyon’s most fragile and unique features – such as springs, seeps and waterfalls that many species, including man, depend upon within the canyon walls, and could directly impact the Colorado River and its tributaries,” Eberle said. The third threat is uranium mining, which is mostly present on the north and south rims of the canyon, although mining is not allowed within the national park’s boundaries. Both active and inactive mines can be harmful to the area’s water supply. 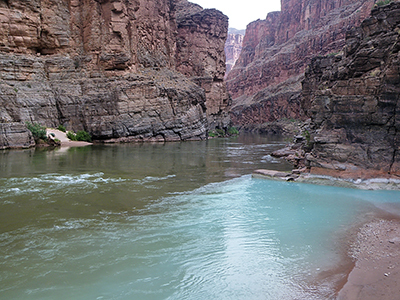 According to the American Rivers study, a major creek in the Grand Canyon has been monitored for more than 20 years, and the findings indicate contamination of the creek by an inactive mine. According to Eberle, these mines affect both the surface water and groundwater of the park and pose a major threat to the Colorado River and the park as a whole. Several people disagree with this assertion. Curtis Moore is spokesman and vice president of Marketing and Corporate Development at Energy Fuels, a uranium mining company that has mines located outside the Grand Canyon. 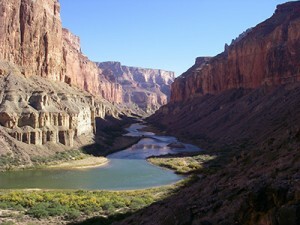 According to Moore, the company’s mines have no effect on the Grand Canyon or the Colorado River within it. The Colorado River is connected to several springs and creeks in the Grand Canyon, including the Little Colorado and Havasu Creek. With the release of this year’s list, American Rivers hopes the U.S. Department of the Interior and the U.S. Forest Service, a sister agency of the National Park Service within Interior, will help find a solution to preserve the park and protect it for years to come. The group also encourages the public to take action and speak out about the dangers facing not only the Colorado River, but also the other rivers included on this year’s list. The America’s Most Endangered Rivers annual reports have been highlighting threatened rivers since 1984. According to Eberle, several criteria are used to compile the list, including the significance of the river to people and wildlife, the size of the threat and a decision that the public can help influence outcomes of in the coming year. Eberle, along with American Rivers, hopes the report will make an impact and help save some of the nation’s natural wonders. Anyone who wishes to stay up to date on the progress of American Rivers, or anyone who wants to participate in its efforts, can visit http://americanrivers.org.